Oblique aerial view of Carrick Castle, looking NW. 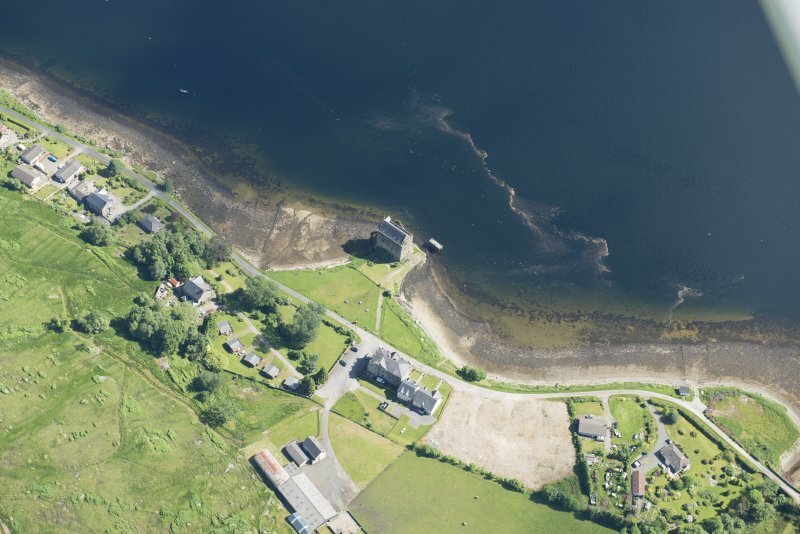 Oblique aerial view of Carrick Castle, looking NNE. 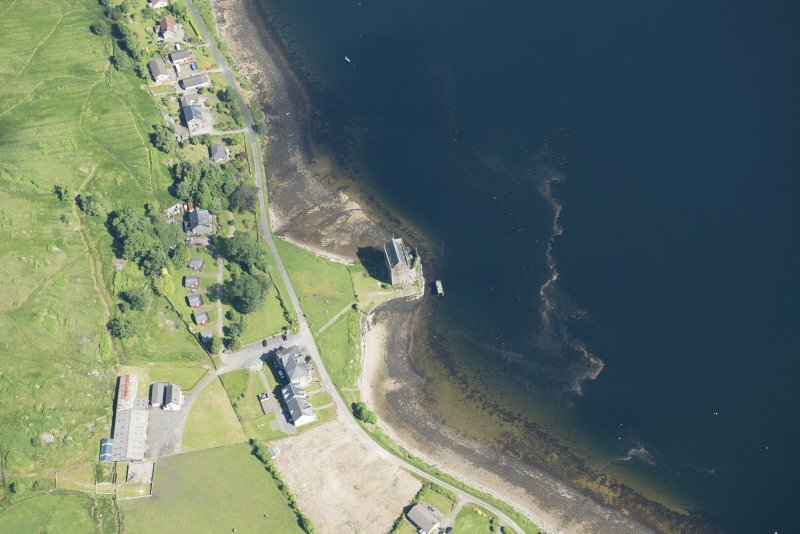 Oblique aerial view of Carrick Castle and village of Carrick, looking SSE. 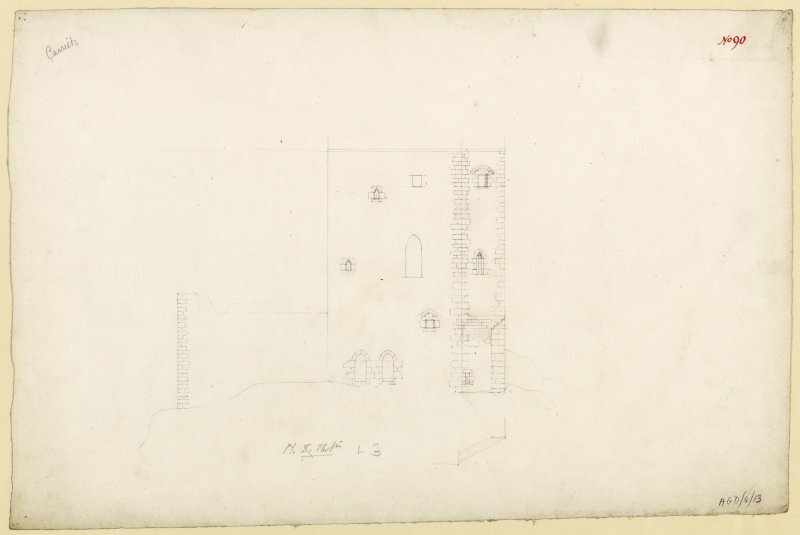 East elevation of Carrick Castle. 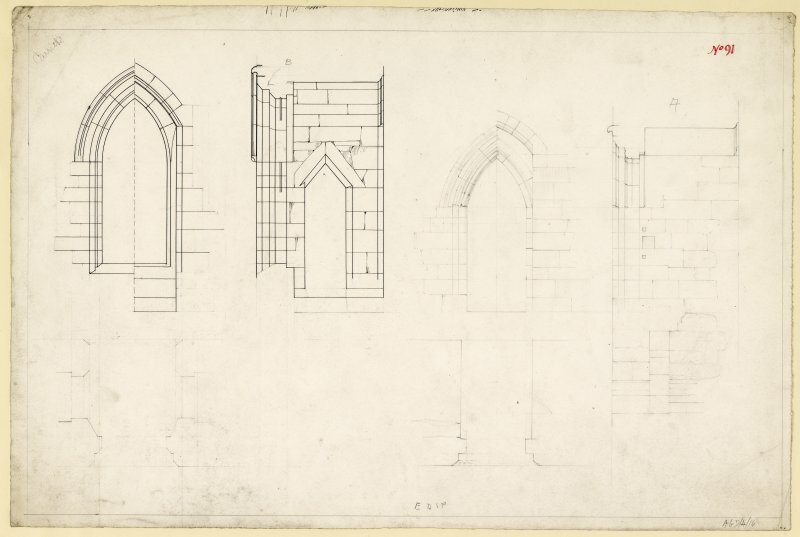 Plan, elevation and sections, drawing of windows in North wall with piscina, aumbry and oratory on second floor of Carrick Castle. 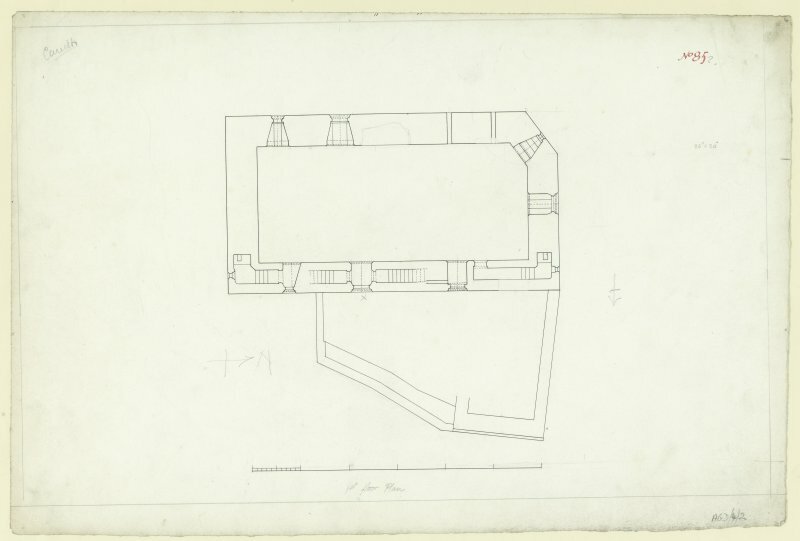 Second floor plan of Carrick Castle. 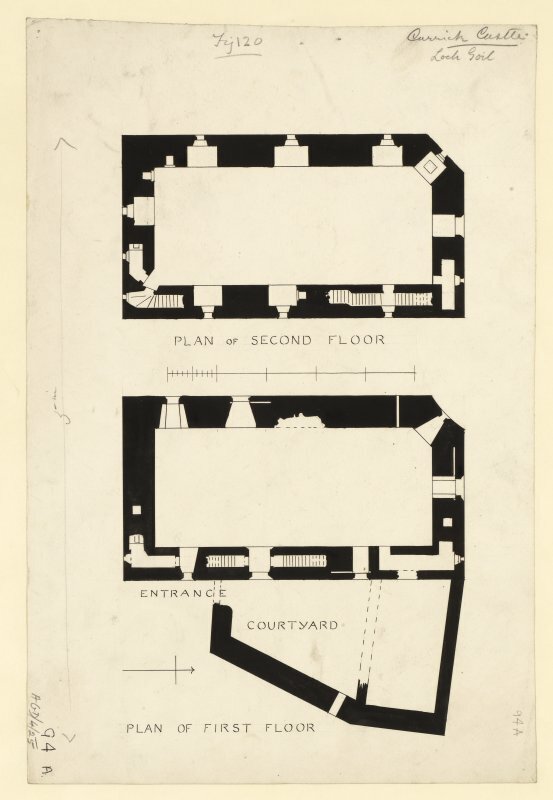 Ground floor plan of Carrick Castle. 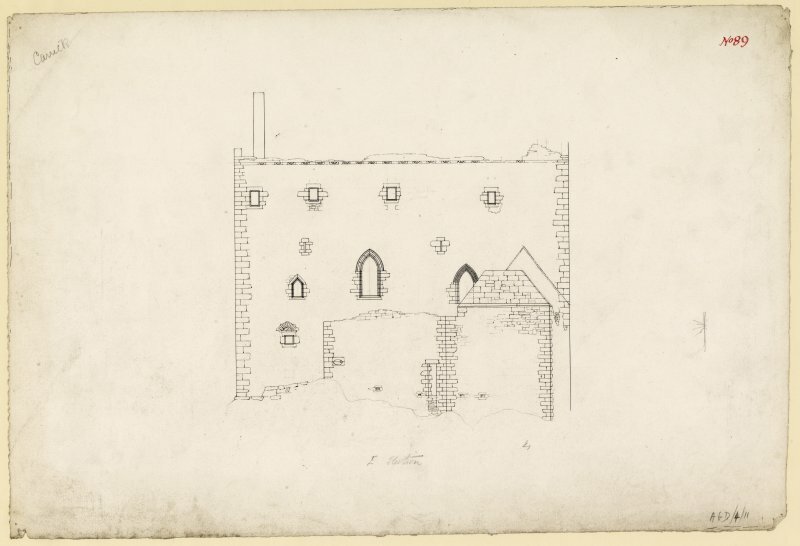 North Elevation of Carrick Castle. Long section looking East of Carrick Castle. Carrick Castle. General view from South-East. Carrick Castle. General view from North-West. Oblique aerial view of Carrick Castle, looking S.
Details of entrance door and window, hall floor of Carrick Castle. 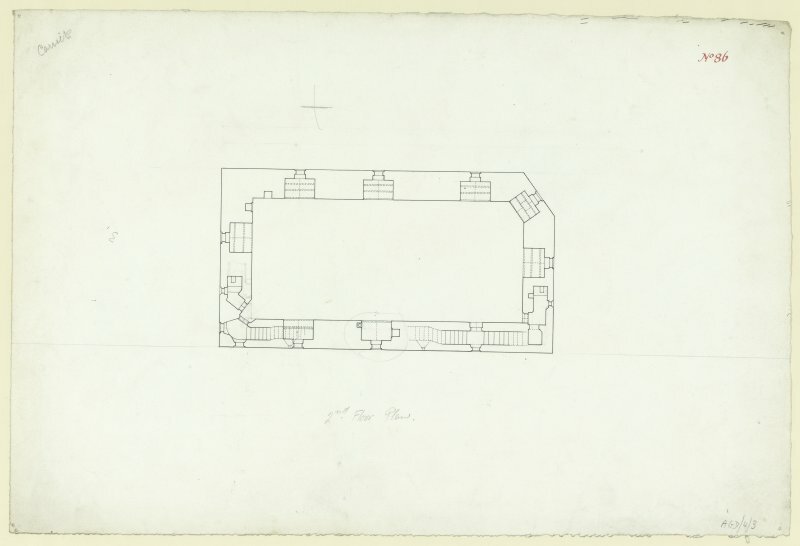 First floor plan of Carrick Castle. Carrick Castle. General view from South. Carrick Castle. 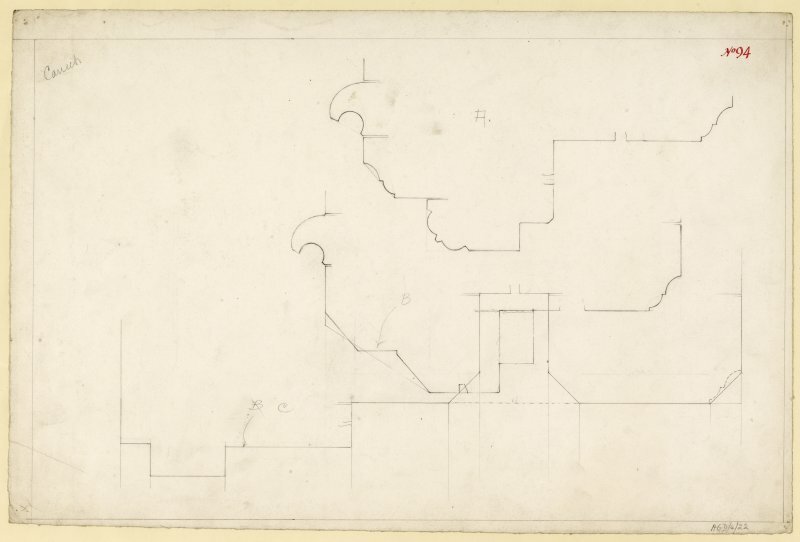 Photographic copy of sepia wash drawing, general view from South. 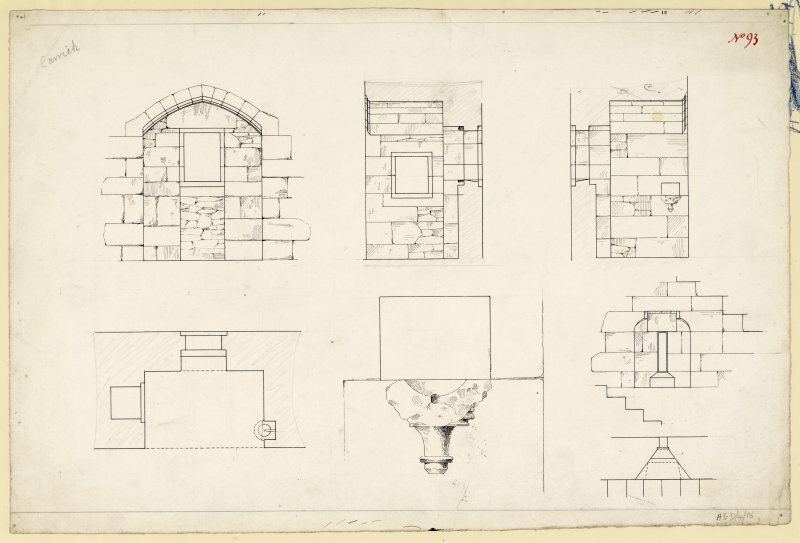 Window and door jambs and archmoulds of Carrick Castle. 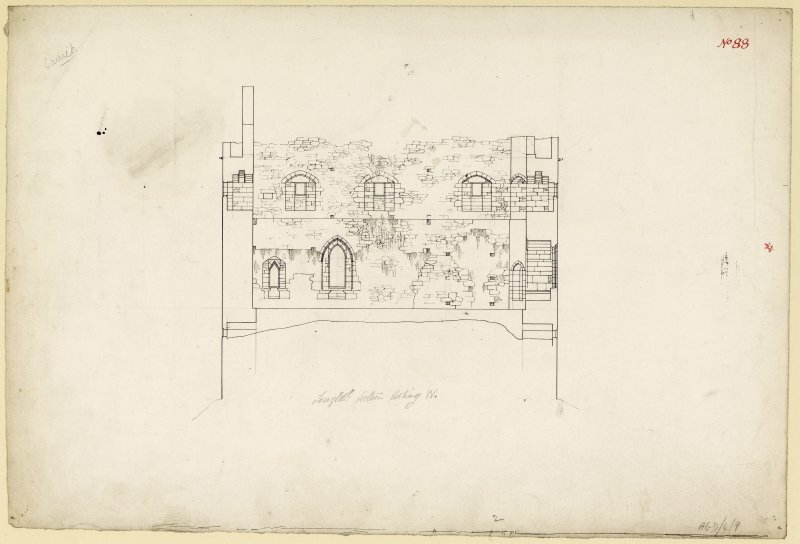 Detail of Hall and second floor windows of Carrick Castle. Oblique aerial view of Carrick Castle, looking NE. 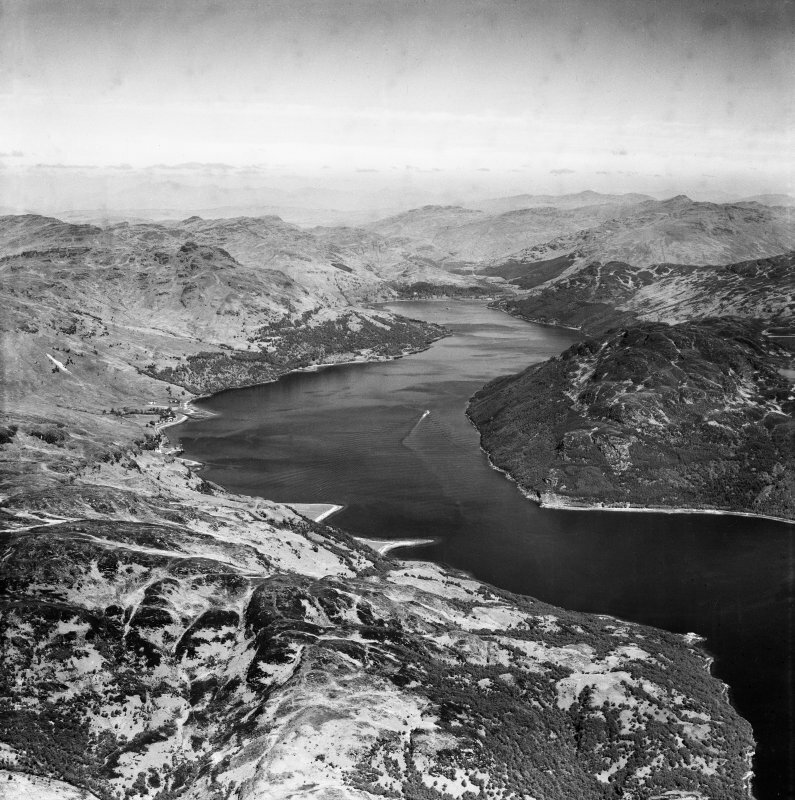 Loch Goil, general view. Oblique aerial photograph taken facing north. 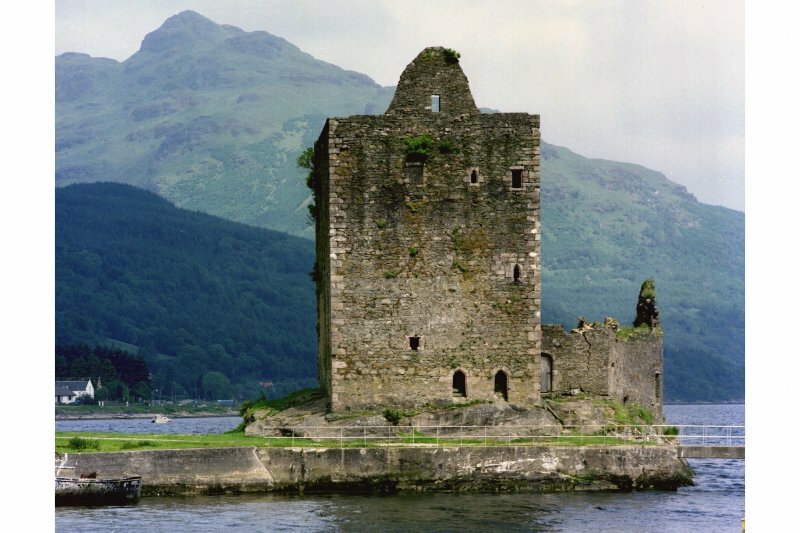 Carrick Castle, which dates from the 15th century, is built on a rock jutting into Loch Goil. Though ruinous, the oblong building is still in a fair state of preservation, standing four storeys high. 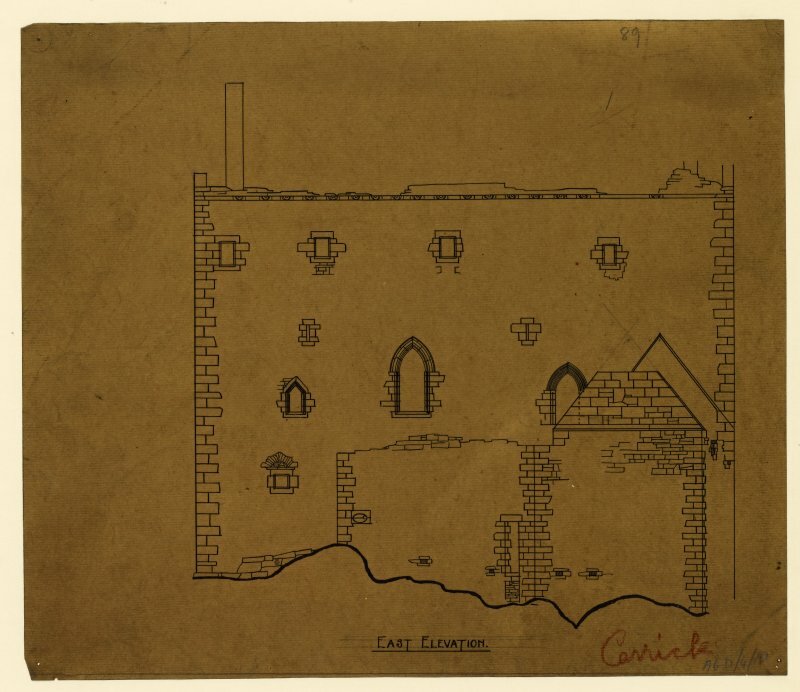 There are fragmentary remains of a subsidiary courtyard to the E, or lochwards. Allegedly a hunting seat of the Scots kings, Carrick was originally a Lamont stronghold, passing to the Campbells in the early 16th century, and later to the Murrays, Earls of Dunmore. 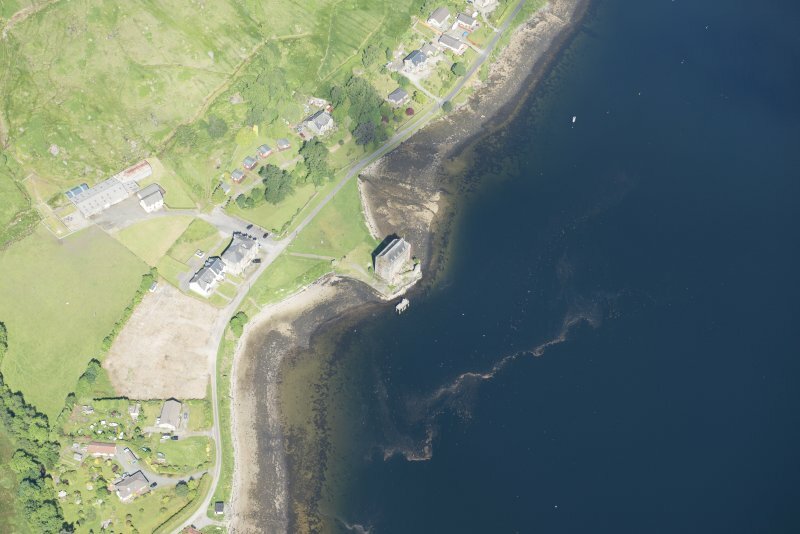 In response to the proposed conversion of the ruined castle to a habitable dwelling, AOC (Scotland) Ltd excavated two small assessment trenches, (4m by 2m and 2m by 1m), within the main tower. Both contained complex sequences of demolition deposits. In the former, a shelf in the N wall was discovered, apparently intended to support a wooden floor at ground floor level, an unusual feature. Provision, in the form of beam sockets, for a similar floor in the S end of the tower was revealed in a trench excavated by John Cannel in 1985. Beneath the shelf over 1.5 depth of demolition rubble containing roof slates filled a space which have been a cellar. A 1m wide and 7m long sondage was excavated inside the castle along the S wall during two-week long excavations in 1993 (April and July). The purpose of the excavations was to allow services access. 2m of stratified deposits were examined and indiacte four main phases - IV: abandonment and collapse; III: occupation (15th - 16th century); II: rebuilding, and I: 14th-century occupation. Phase I: Consists of a 20cm-deep organic/occupation deposit containing iron objects, animal bone and a considerable quantity of pottery provisionally dated to the 14th century on the basis of sherds of imported saintonge ware (1280-1300). This occupation deposit sits directly on bedrock which has been quarried, not very successfully, to an uneven surface. This surface is drained by two drains through the S wall. The foundations of the castle walls consist of a stepped platform and the stepped ledge against the W wall was probably also utilised as the base for a timber 'A'frame associated with phase I. It is clear that the basement was sub-divided from the earliest occupation and a N to S wall splits the basement into two distinct areas, 4m and 3m wide. Only the western room was excavated to bedrock. It is suspected that a lower room is to be found in the SE corner of the tower. A centrally placed post pad against the S wall and directly beneath a beam slot at first-floor level is a feature of the original construction of the castle which continued in use after the re-building phase (II). While phase I may represent the construction phase of the castle the depth and richness of the deposit suggest occupation. Phase II: A dump c50cm deep on average, of building materials. A layer of sterile clay was deposited on the phase I occupation deposit and then substantial dressed and mortared stones dumped. 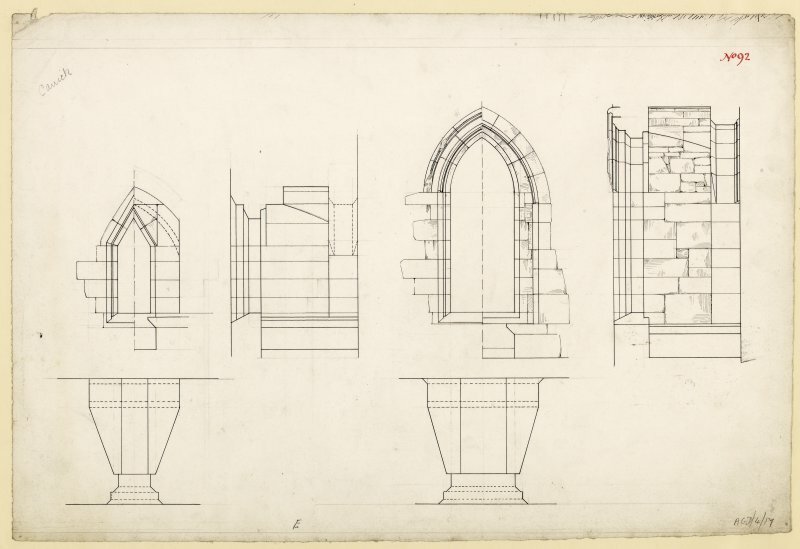 The quality of the stonework and presence of joining and mortared blocks suggests renovation and rebuilding. This deposit fills the basement up to the level of the ebam slots in the S wall suggesting that these beam slots - four in total - are indicative of the second occupation phase (II) although they may also have been in use with the pahse I occupation. Phase III: A predominantly gravel layer containing many lenses and evidence of resurfacing. This occupation surface extends the full width of the tower (phase I only seen in W room) with the activity apparently concentrated in the E and rubbisd thrown away to the W. This occupation phase is rich in artefacts with considerable quantities of pottery and bone. Two French imported vessels dating to the mid-16th century, a late 15th-century Nuremburg jeton and a finely decorated 15th-century knife handle suggest this occupation phase lasted throughout the later 15th century and 16th century. A substantial hearth is located under the window in the E corner of the tower which had a piece of copper-coated iron pipe and burnt-out barrel associated with it. The discovery on the associated floor a short distance away of a very fine copper still 'worm' suggests these are the remanants of a still. Phase IV: Abandonment and collapse of the castle which has been truncated by Victorian rubble clearance. Excavations were also conducted in the ground floor entrance passage and some rubble was removed from the trench at the N wall, excavated in 1992 by AOC (Scotland) Ltd. Entrance passage 2m by 1.10m. Considerable Victorian disturbance to these deposits. The bedrock had been levelled up with mortar infilling. Three steps led up into the castle; they have been robbed away and only their mortar and stone footings remain. North wall trench: Removal of massive mortar bonded rubble blocking revealed garde-robe chamber in NW wall. 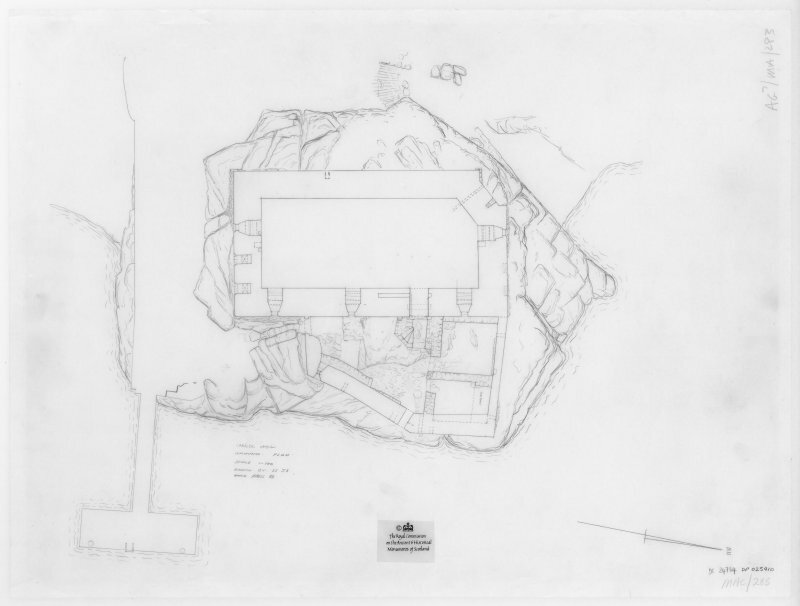 NS 1941 9447 Excavations were carried out by Kirkdale Archaeology from March until May in the interior of Carrick Castle, a probable 14th-century tower house, on the shores of Loch Goil, Argyll. The entire basement deposits were cleared to bedrock, in advance of continuing renovations being carried out by the owner. Carrick Castle stands on a rocky promontory, from which it takes its name (Carraig = rock). 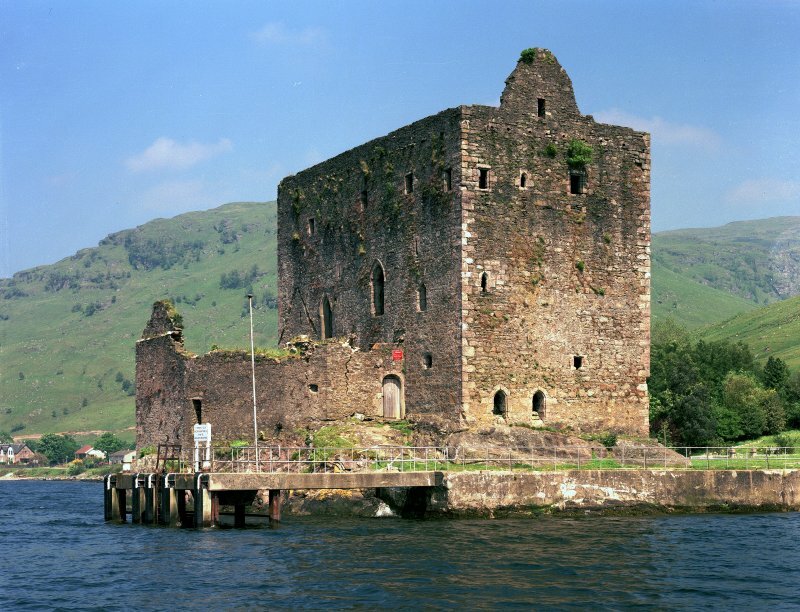 The castle was erected by the Campbells of Lochawe, and was held for them by a series of hereditary captains, serving as an important staging post and caput for the clan during the 16th and 17th centuries. 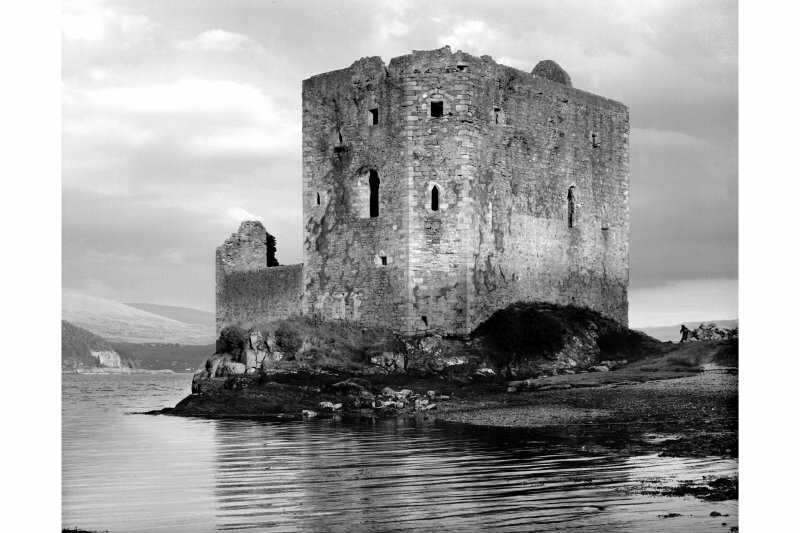 The castle was bombarded by HMS Kingfisher in 1685, during the ill-fated uprising against James VII, in which the 9th Earl of Argyll was prominently involved. The tower was badly damaged, being rendered roofless, and saw only sporadic occupation from that point onwards. The recent excavations revealed evidence of occupation and use dating to the latter part of the castle's main period of occupation (ie the later 17th century), although traces of earlier structures and artefacts were recovered (including the possibility of an earlier structure on the site of the present castle). Most of the artefacts recovered date to the later period, but finds of two worked rock crystals may indicate the presence of medieval craftsmen, and the finds of an incised slate and a small copper-alloy bell may also represent medieval occupation. 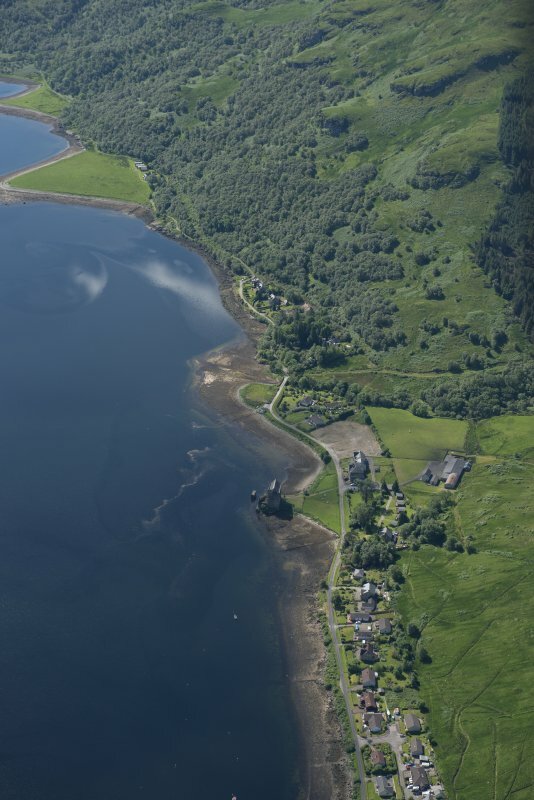 The bulk of finds and structural evidence revealed belong to the 16th and 17th centuries, during which time the castle basement was used variously as a storeroom, arsenal and fortified hold on the loch side. After initial clearance of modern deposits, remains of cross-walls were exposed, revealing that the basement had been sub-divided during its period of use as an arsenal/storeroom. A cache of iron cannon balls recovered from within one of the rooms provided an insight into this period of the castle?s history. 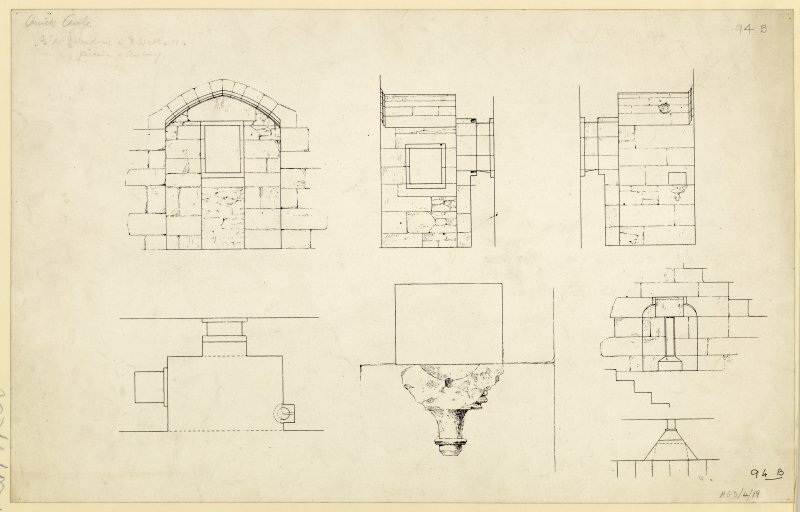 Subsequent remodelling occurred, reflected in newly defined access routes within and between rooms, and the creation of a new chamber to the N of the castle. 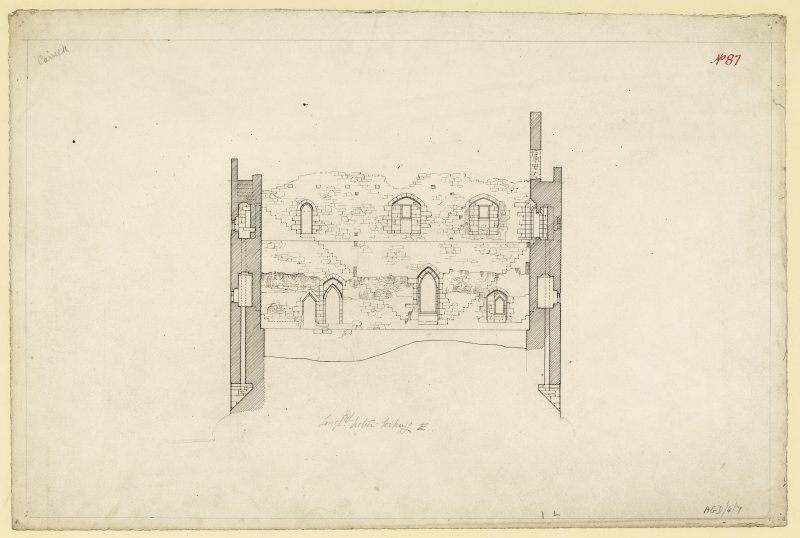 Beneath the 16th and 17th-century evidence to the N of the basement, the remains of a vaulted chamber, pre-dating the military usage of the castle, were uncovered. Within the chamber floor was a massive, rock-cut pit prison, which probably dated to the initial occupation and construction of the present castle, and which may have pre-dated the vaulted chamber itself. The waterlogged deposits within the pit prison yielded substantial organic remains, including traces of a wooden door, complete with iron studs, structural timbers, and fragments from several leather shoes. The extensive environmental sampling strategy should reveal further evidence of the daily life and economy of the castle's inhabitants. This site has only been partially upgraded for SCRAN. 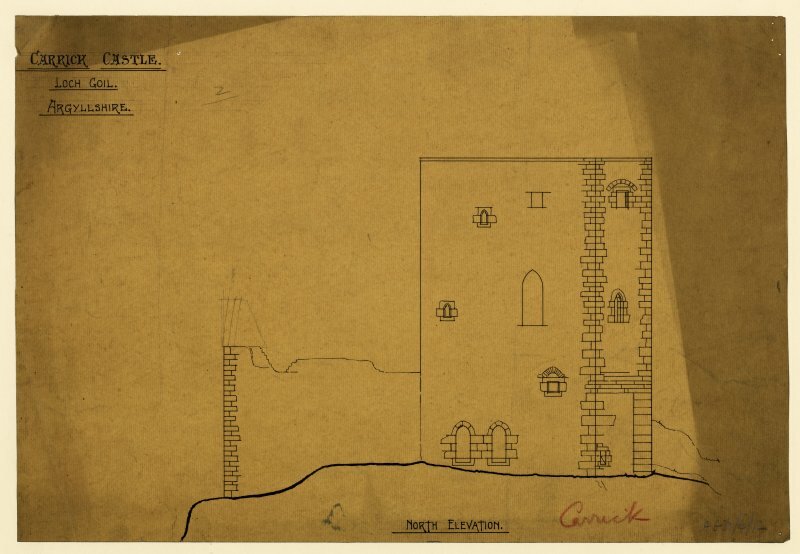 For full details, please consult the Architecture Catalogues for Argyll and Bute District. 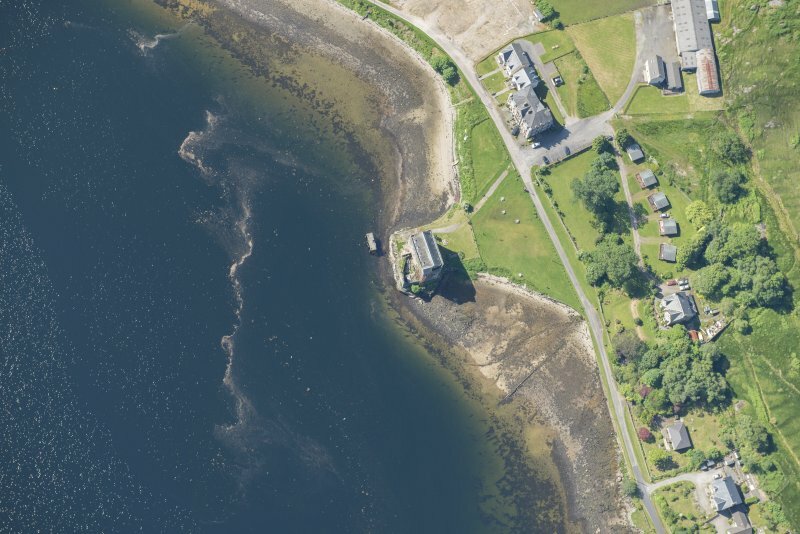 This castle is situated on a rock (Gaelic, Carraig) on the W shore of Loch Goil, 2.5km from the mouth of the loch and enjoying a view SE across Long Long to the Dunbartonshire coast. The steep hinterland provided limited arable land, but this was compensated for by gently shelving shingle beaches to NW and sw, and a good deep-water mooring immediately to the E.
A large tower of probable late 14th-century date occupies the W half of the rock, which rises about 6m above high-water level and measures about 33m from N to S by 28m, and a later barmkin wall descends on the E to within 3m of water level. 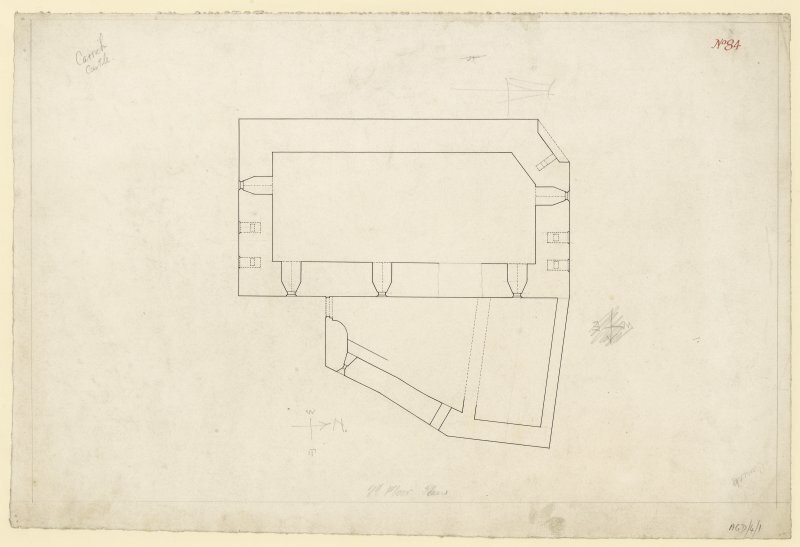 There is a Ministry of Defence concrete pier, replacing a timber steamship pier of 1877 (en.1), at the SE angle of the rock, but rock-cut slots suggest earlier jetties further N, near the entrance to the barmkin, and there are sockets for a possible landing-stage below and N of the postern-doorway. To the W is a level area, probably made up artificially, and it was stated in 1792 that the rock was 'formerly surrounded by the sea, by means of a deep ditch. The entry to the castle from the land, was by a draw-bridge, which was defended by a strong wall, and two small towers’ (en.2). There are no identifiable remains of these outworks, with the doubtful exception of some large boulders about 2m W of the rock, which are more probably to be associated with a boat-noost or hut. 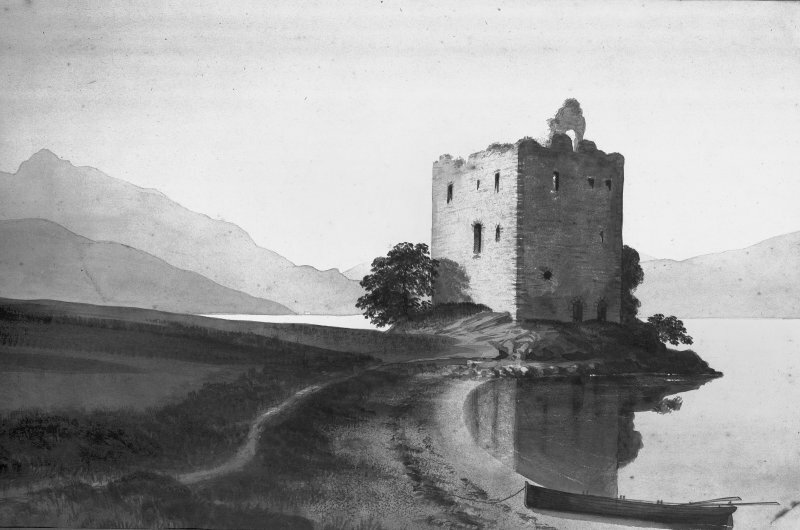 The tower was probably built for the Campbells of Lochawe, later Earls of Argyll, and the castle was occupied on their behalf by hereditary captains from about 1500 to1685, when it was burnt by Government forces during the 9thEarl of Argyll's rebellion (infra). During repairs of about 1900 there was extensive repointing and re-instatement in concrete of robbed sandstone dressings. 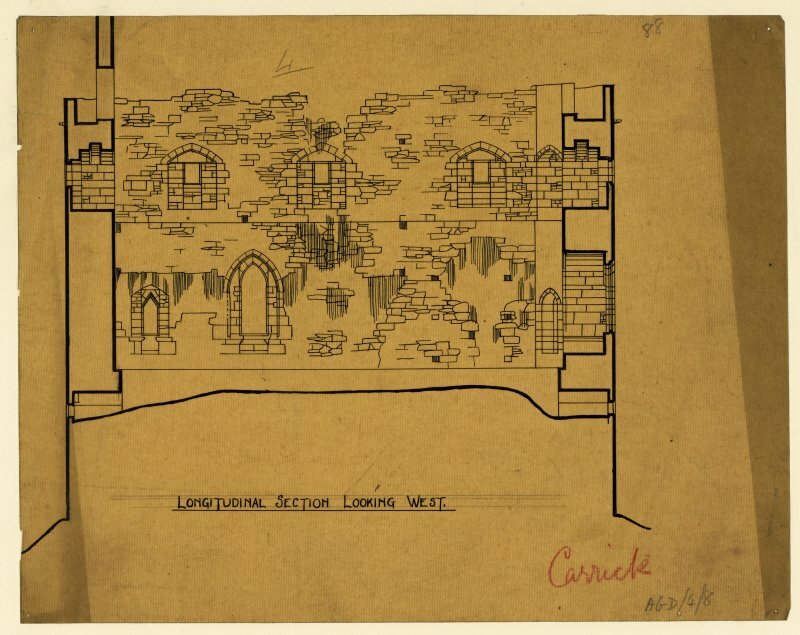 The building's condition shortly before that time was recorded by MacGibbon and Ross and in drawings published by the National Art Survey (en.3). 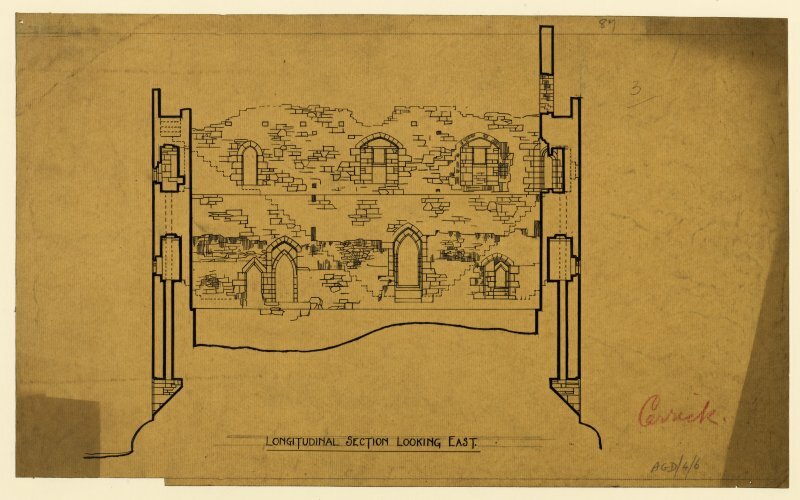 The courtyard was excavated in 1985 for Historic Buildings and Monuments: Scottish Development Department, in advance of a current programme of restoration of the castle for use as a private residence (en.4*). 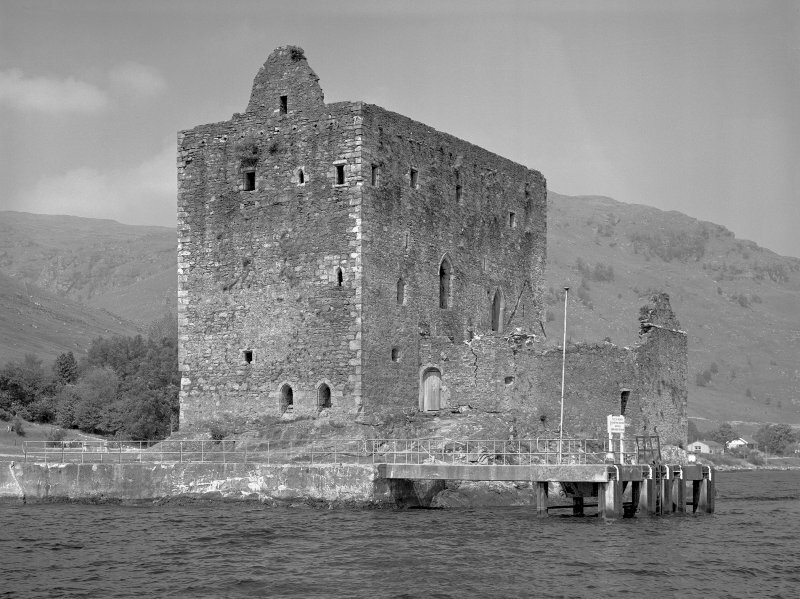 The large elongated rectangular tower has no parallels in Argyll, although many of its features can be compared with those of Lowland buildings, themselves often of uncertain date. 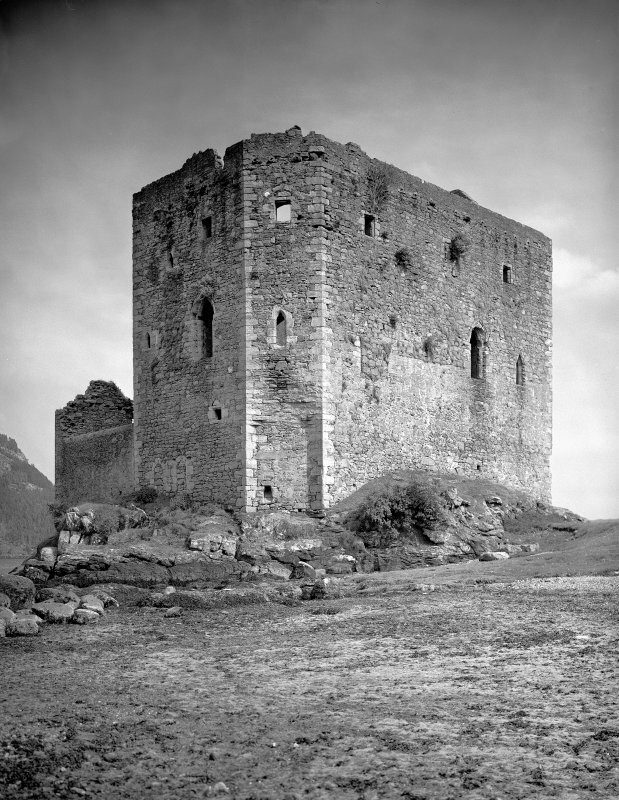 However, the bevelled NW angle and the triangular-headed openings can be parallelled respectively at Dundonald Castle and at David's Tower in Edinburgh Castle, and there are numerous resemblances to Morton Castle, all major works of the second half of the 14th century (en.5*), at which period the Campbells had achieved a dominant position in Lochgoilhead parish, and Carrick may be attributed to that period.